Gmail’s phishing alerts warns you of suspected messages. Gmail’s Phishing alert service warns you whenever you get any message from a suspected source. These alerts are triggered to let the end user know that the message might not be from the person whom he claims to be in the mail. Being focussed on helping laymen become tech enthusiasts, i often write about critical topics which everyone needs to be aware of, in general to protect and secure themselves in the cyberworld. Earlier, i wrote How not to get Phished,Learn from Phil the Fish and Learn more about Phishing which certainly helped readers understand the simple ways of protecting themselves. However, there still can be situtations when you are duped in such a way that you fall prey to such exercises. Whenever you get an email in your Gmail mailbox, Gmail does a virus check against it, runs it spam filters to see if it has indeed come from a spammer and also runs a Phishing alert service to alert the user if this is indeed a Phishing mail. Gmail Phishing Alert warns you of suspected messages. The above figure clearly depicts how Gmail can help you stay safe from Phishing. However, have in mind that Gmail’s service can also be duped by some tricksters. Are there any ways to help me stay safe and not get Phished? Always go through the URL of the website. A closer look at the URL can certainly give you clues with regards to the fraudulent websites. Never reply to emails asking for your bank account number, internet user details etc. Remember NO BANK asks you for such information. If they do, CHANGE YOUR BANK. The old saying “When in doubt, talk”, holds true here as well. If you are in a doubt about the email/website, just take the phone and call up the call center of the service to get an explanation on your doubt. Don’t open email attachments sent to you by strangers. Email attachments can have programs which can affect your computers once opened. Always follow steps to a healthy PC. You can read my previous post 4 steps to a Healthy PC to learn more on this. Always keep your Anti Virus Softwares, Spywares and Firewalls updated. You can use Update Checker which happens to be a free service for this. Also read my previous post Use Update Checker to Keep your Softwares UPDATED. Recently there has been a spurt in the phishing attacks and therefore this Gmail alert certainly helps users stay safe to an extent. Google also issued a statement recently informing users that the security lapses are not within Gmail but its the Phishing attacks which are responsible. Do stay tuned to Technofriends for more, one of the best ways of doing so is by subscribing to our feeds. You can subscribe to Technofriends feed by clicking here. Gladinet is an interesting yet free Windows application that runs on your desktop and offers easy access to files stored online or across remote PCs. If you have a some content stored in online services like Google Docs, Amazon S3 and Windows Live Skydrive , Gladinet allows you to manage your content by making all of your files accessible from a virtual drive mapped into your Windows Operating Environment, thereby letting you update and modify files stored on the above mentioned services. Once you have updated those files, Gladinet uploads the new version back to its original space in the cloud. This therefore elimiates the need for downloading the files onto your computer, editing them and again pushing them back onto the internet cloud for storage. Remote Access To Multiple PCs : Gladinet connects all your PCs together. You can access folders on multiple PCs from any one of them. You can also use remote access solutions such as RDP or VNC among them. Your PCs are always connected even when you are on the road. On Demand Sharing: Sharing Files and Folders is as easy as sending an e-mail or an instant message. Your friends can view your shared files instantly and securely without any Gladinet software pre-installed. You can share both local and online files. Use Web Applications Locally: Use online office to open local spread sheets. Use Paint Brush to open online images. Use online storages as if they were local folders. Gladinet software delivers web applications and online storages to your desktop. on similar lines, Gladinet was designed for delivering web services to your desktop. It then goes a step further than the web browser by integrating web services into the Operating System. The below given figure explains the entire process. Gladinet — How it Works? Folders from Remote PCs – Standard Version only. As i write this, Gladinet, is still in its Beta release. Nirsoft, the creators of WirelessKeyView, software which can help you get your Wireless Keys in case if you have forgotten them, have now released the Major IP Addresses Blocks by Country. For countries in europe and in the middle east, the name of the company/Internet provider that own these IP blocks is also displayed. In order to show only the major IP blocks, only IP blocks with 4096 addresses or more were added to the list. For United States, only IP blocks with 65536 addresses or more were added to the list. You can access the complete list on Nirsoft’s Website. What is an IP Address? How can i find my IP Address? IP Address is in short, the address of your computer. Using this address it is identified over the internet and your local network. Since these numbers are usually assigned in country- or region-based blocks, an IP address can often be used to identify the location from which a computer is connecting to the Internet. If you are interested to know your IP Address, read What’s your IP Address? How to Use this List? Can you give some Example Usages? Well, to take practical scenarios, First example to take from this list is that it can be used to identify the location of a particular IP. This could be the IP of the person who sent you a mail on your Yahoo Mail account or IP of the person who sent you a mail on your Gmail account. The other example usage can be testing your web application for geo-targeting. If you have a web application which geo-targets content based on the end user’s IP address, you can use any of the IP Address listed against the country of your choice and test your Web Application. This can be done by enabling and Modifying the X-Forwarded-For header in the HTTP Request. To do this, you can either use Fiddler or Modify HTTP Headers. The X-Forwarded-For (XFF) HTTP header is a de facto standard for identifying the originating IP address of a client connecting to a web server through an HTTP proxy or load balancer. This is a non-RFC-standard request header which was introduced by the Squid caching proxy server’s developers. Also, if you are a geek, you can develop your own script to figure out the location of a particular IP Address using the IP Address Blocks given in the list released by Nirsoft. Can you List any other website which helps me find the location of a given IP Address? Also Read: How does Google knows if you are a Adsense client and clicking on your own ads? How-To Send Free SMS using Yahoo Mail? Firefox Addon URLbarExt 1.4.8 is an interesting Firefox Plugin which extends the functionality of your Location bar with set of commands which can help you Tiny your URL using Tiny URL, Copy URL, Search Site, Page Tagging and others. 1- Go up one level,or directly to the root of the current site(double click). 2- Copy the current site URL OR custom formatted URL. 3- Shorten the URL using your favorite service. 4- Search the current site using Google. 6- Navigate through sequential URLs. 7- Surf anonymously using online phproxy servers and Unblock filtered websites. You can show/hide any icon you don’t need using the settings dialog. URLBarExt also has a Youtube channel where you can find interesting videos related to the usage of this extension. Do note that you would be required to login to the Mozilla website to download this add-on as it is still in experimental mode. Do you store your passwords using Firefox? Gmail Launches Voice and Video Chat. Gmail, the email application from Google, now allows users to do both voice and video chat using a voice and video plugin. This is an interesting move by Gmail which earlier allowed users to have fun with more emoticons and invisible mode for Gtalk inside Gmail. All you have to do is download and install the voice and video plugin and we take care of the rest. And in the spirit of open communications, we designed this feature using Internet standards such as XMPP, RTP, and H.264, which means that third-party applications and networks can choose to interoperate with Gmail voice and video chat. 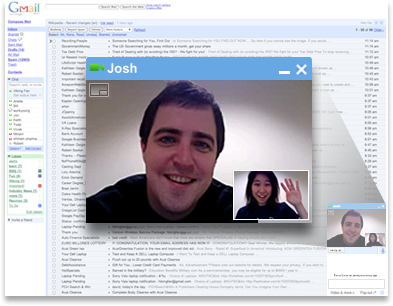 Once you install the plugin, to start a video chat, just click on the “Video & more” menu at the bottom of your Gmail chat window, and choose “Start video chat.” You’ll have a few seconds to make sure you look presentable while it’s ringing, and then you’ll see and hear your friend live, right from within Gmail. The below embedded video also gives a clear view about the entire action. For those of you checking out this post on reader, click here to see the video. So now go ahead and Talk face to face right inside Gmail with free, high quality video and audio. Also read: What is OpenID and how to use your Gmail account as OpenID. [How-To] Create Group Mailing Lists in Gmail. Twitter Grader helps you rank yourself against all the other Twitter users. In order to check out your Twitter Grade, all you need is a twitter id. You can even check out the twitter grade of other users. In short, Twitter Grade measures the relative power of a Twitter user. It is calculated as a percentile score. 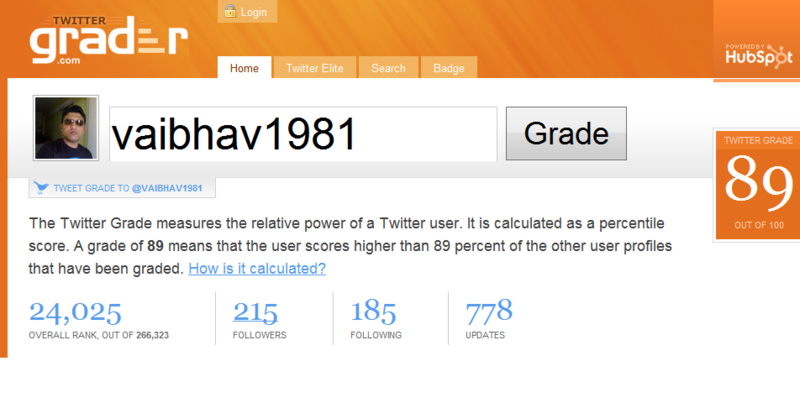 A grade of 89 means that the user scores higher than 89 percent of the other user profiles that have been graded. DNSDataView is a GUI alternative to the NSLookup tool that comes with Windows operating system. It allows you to easily retrieve the DNS records (MX, NS, A, SOA) of the specified domains. You can use the default DNS server of your Internet connection, or use any other DNS server that you specify. After retrieving the DNS records for the desired domains, you can save them into text/xml/html/csv file. For those of you who are not aware of NSLookup, it is the name of a program that lets an Internet server administrator or any computer user enter a host name (for example, “technofriends.in”) and find out the corresponding IP address. It will also do reverse name lookup and find the host name for an IP address you specify. Top 10 Password Crackers .. REVEALED.